The Model Hub is a Glasgow based non-exclusive modelling agency serving our clients across the country who specialise in print media advertising, fashion, catwalk shows, events, creative marketing and the professional photography sector. Having originally formed with just a handful of models used in local newspaper advertisements, we have quickly grown and now regularly provide models for fashion shows, wedding fayres, launch events and location/studio shoots. With many well known and highly respected agencies in Glasgow and Edinburgh catering for exclusively contracted models, we formally launched as 'The Model Hub' in October 2011 to bring our own unique and professional approach to the freelance model industry. 2012 saw us launch a production service, enabling our Marketing and Events team to fully organise and host promotional events and fashion shows covering everything from lighting, staging and audio/visual work. As well as utilising talented models and creatives, we also work with top Scottish entertainment talent in the form of comperes, celebrity guest speakers and dance crews. We have adopted an open and honest scouting policy where everyone can apply and all applications are considered regardless of height or body shape. However, we only represent models we believe are both photogenic and have the perfect combination of personality and professionalism, which is paramount in securing regular and repeat bookings from our growling list of clients - diva's need not apply. The Model Hub are firmly behind the ethos that priority should always be placed on health before the industry perception of beauty and we actively promote a more natural look in our models. As such, we are fully in support of Cancer Research UK's "R UV Ugly" campaign and have a "No Sunbed" policy as well as having various other guidelines and support structures in place regarding healthy eating and positive weight management. Finally, we understand the modelling world can be a daunting place for many newcomers keen to take their first steps into the industry. So to help develop our models careers, we provide a full mentoring service, portfolio building photo shoot opportunities using hand-picked and vetted photographers, make-up artists and hair stylists, plus all New Faces are offered chaperones when attending photo shoots. 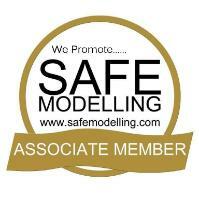 The Model Hub are proud to be Associate Members of the Safe Modelling Organisation. We actively promote a "safety first" ethos within our team and provide advice on any current money making scams, unsavoury people to avoid and how to ensure they remain safe in their chosen field. The Safe Modelling Organisation work with Trading Standards, local authorities and other organisations to protect not only the models, but also photographers, creatives and studio locations.